At Surani Clinic we use state of the art technology. 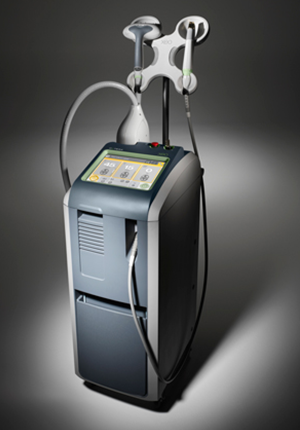 We use the American Dermaogical Society's "laser of the year" the Cutera coolglide and also the Prowave. For Laser hair removal we use different lasers for different skin types so that we are able to treat all clients from the lightest to the darkest skin tones. This gives us the advantage of removing unwanted hair permanently with a great success rate. We use an additional Zimmer's cooling system to numb the skin so the treatment is comfortable and there is no need for anaesthesia. The CoolGlide™ Laser system is simply one of the best laser hair removal system on the market for all skin tones from light to dark, including tanned patients. Its unique design with a longer wavelength and an innovative cooling system allows extremely effective, safe, and permanent results. The system generates a beam in the critical 1064 nm range at a high enough power to vaporize the carbon particles in the fine and coarse hair on all skin types. Our CoolGlide™ Laser is, in fact, capable of generating 14,000 watts of peak power, more than any other laser available for office use. In addition, for larger areas of hair removal, we use the new Pro-Wave Laser which is fast and efficient, especially for light skin and finer hair. The Pro-Wave essentially works like three lasers in one hand piece. Laser hair removal is a non-invasive method of photoepilation, which does not require needles or messy chemical creams. Since thousands of hairs can be zapped in a single treatment session, large areas like the back, shoulders, arms and legs can be effectively and efficiently treated. All treatments are performed by Dr. Surani. The first visit is a complimentary consultation and if necessary test spots are done to give the client an idea of how the laser feels and to make sure that there is no adverse reactions. The Cutera® CoolGlide™ laser generates a pulse of intense, concentrated light directed through a small, cooled hand piece that is gently applied to the treatment site. This laser energy passes through the skin to the hair follicle, where the energy is absorbed by pigment in the hair and hair follicle, causing selective damage to the hair root without damaging delicate pores and structures of the skin. The laser is pulsed, or "turned on", for only a fraction of a second. Dr. Surani will carefully determine the duration of the pulses so that laser energy will be absorbed by the hair follicle without transferring excessive heat to the surrounding skin. While treatment is going on we also utilize a separate Zimmer Cooling system to protect the skin further. The gold-plated cooling head glides over the skin (CoolGlide™) half a second before the laser beam. This selectivity helps to protect the skin, while effectively treating the unwanted hair. Areas that would take hours with electrolysis are addressed in minutes. Some of the hair that was in the treated follicles is wiped off immediately after treatment, and the rest is shed over the next 2-3 weeks. The hair roots that have been destroyed are reabsorbed by the body. Immediately after treatment, a cooling aloe vera gel is applied, as well as medical-grade sunscreen for the face and on any treated areas that will be exposed to the sun. The skin may appear slightly red for a very short time but this usually resolves rapidly and there is no restriction in activity. Hair grows in three cycles. At any one time about one-third of the hair is in the growth phase, one-third in the regression phase, and one-third in the resting phase, multiple treatments spaced four to eight weeks apart are usually necessary to disable most of the hair follicles in given area. Why should I consider laser hair reduction? It's so expensive! Laser hair removal is convenient, safe and efficient. While no laser can guarantee hair-free skin, the laser will remove up to 75%-90% of hair within 6-8 treatments. Just imagine no longer needing to dedicate extra time for shaving or scheduling time for waxing or electrolysis appointments. See our Laser Hair Reduction package.